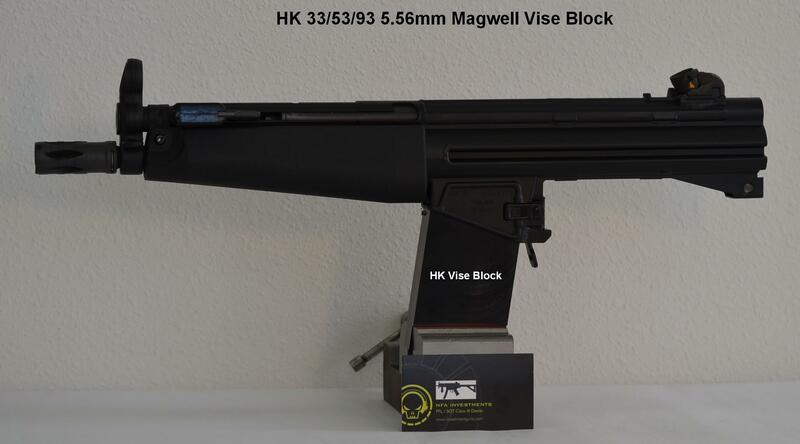 Our H&K Vise Block will accommodate Heckler & Koch and most all HK Clone receivers for performing all of your cleaning and gunsmith projects. These are CNC machined out of the extremely durable material called Delrin and have a 7 degree forward tilt so any cleaning fluid can naturally run out the muzzle of the barrel. Also incorporated is the magazine catch slot so the receiver locks into the vise block with the magazine lock. We still have some of these 9mm Blocks available, not sure when the next batch of 100 will be ran. We are working on the all new HK33/53/93 Mag well Vise Block and it works just like these 9mm one's, Awesome! These new ones will be available in 2 weeks, we need to get some CNC time and then I can start shipping, they will be 4 bucks more due to more material needed and PayPal (Visa - M/C) will be accepted with a Quick link to pay. 9mm and 5.56mm Vise Blocks are in stock ready to ship, PayPal is accepted! We have a few of each Vise Blocks still available, $26 bucks (ea) shipped via Priority Mail W/tracking # provided! We still have a few of each (9mm & 5.56mm) Vise Blocks still available, $26 bucks ea. shipped via Priority Mail W/tracking # provided!